SK Hynix, Samsung, and Micron have all announced their GDDR6 processes, so availability should be enough to fill NVIDIA's lineup, and AMD's budget and mainstream graphics cards, should the company choose to do so. Simpler packaging and PCB integration should also help in not lowering yields from usage of more complex memory subsystems. Sources: Tweakers.net, Guru 3D, Thanks @ P4-630! I doubt AMD will be ditching the HBM2 implementation for its top tier cards. Availability, packaging and yields can only improve with time, and all the work for the controllers is already done. Seems counterproductive to send all that work to the gutter. There is a reason for AMD and Nvidia to use GDDR6 over the shortcommings of the HBM2 supply. And further some more reasons. This is more about Computing, but it shows a direction in general. I'd say it does. That Intel+Vega thing has HBM and there it makes perfect sense. Well that's Nvidia for you. They bash things they themselves do not use. But hype it to 11 when they start using it. Remembe why HBM was created in the first place! - because GDDR was consuming ever more power. Granted G5X and by the looks of it G6 will keep power consumption at bay due to lower voltages but HBM still has a massive advantage. Plus the slide speculates about future HBM standards we have not even seen yet. I highly doubt future HBM standards up the operating voltage. At worst they keep it at the same level. HBM is also highly scalable in terms of density and die area. I wonder how they worked that out , HBM-type memory is inherently more power efficient and faster. It sure as hell does, all those GFLOPS are useless if you can't access huge chunks of data fast enough. And this includes rendering , as far as current GPU architectures are concerned there is no distinction between compute and classical graphics processing. They use the same resources and are bound by the same limitations. It sure as hell does, all those GFLOPS are useless if you can't access huge chunks of data fast enough. The main difference between the two that is very useful in compute is lower lag of HBM. Bandwidth alone is already there with GDDR5x. GDDR6 beats that. It doesn't and when it gets close it needs a bus and memory chips that span the entire area of the card. Maximum you can achieve on a 384bit bus (typical of today's cards) with GDDR6 is 768 GB/s according to the current predicted spec. V100 with HBM2 gets close to 1 TB/s , I don't know how you figured out that it "beats that". AMD has shown even with HBM power supply die side is still huge, so saving 20W where cooling density isn't an issue...... isn't the issue. Yes it's costly and might make manufacturing more difficult but it outperforms traditional on-board memory in every way. But make no mistake , it's not going away. It will eventually be on the same die. Available and not a year and a half late would also help! There are different companies currently buying up the HBM2 chips. Amd has a contract where it's guaranteed to have a good percentage, but simply not enough to ensure the constant delivery of cards. You have Intel buying up the HBM2. You have IBM buying up the HBM2. And alot more then just AMD or Nvidia. They can only produce an X amount of chips every month. 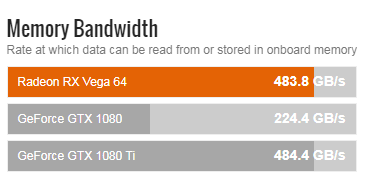 And AMD gets a percentage out of that. That's all great, but the point still stands. Nvidia's P100 HBM2 chip hit the market long ago, but I guess they were sensible (or as some would say... shady). P100 was also a low volume high price part. You were literally responding to a post with memory bandwidth benchmark showing Vega 64 (HBM2) is on par with 1080Ti (GDDR5x). 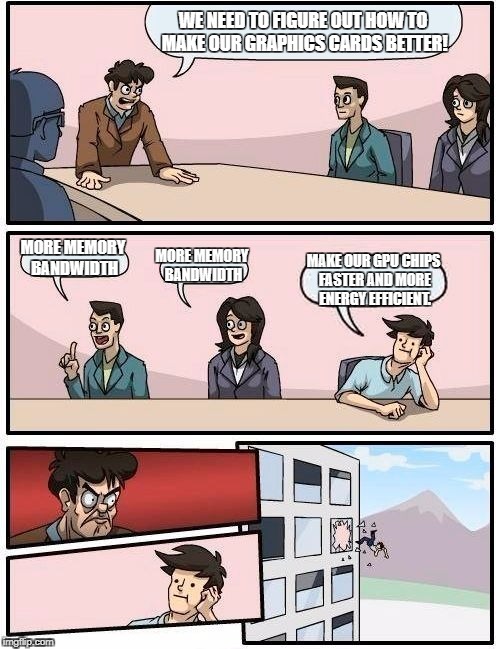 GDDR6 has more bandwidth than that. The concepts of memory type and bus width seem alien to you which is why you can't see that you are wrong. What you are describing has nothing to do with HBM2 vs GDDR5X vs GDDR6 vs whatever. Come back when you have a better understanding of these things. Just an advice. There surely are various configurations possible. All other things the same, using GDDR6 instead of GDDR5X would lead to higher bandwidth. Well you're wrong on that one, GDDR5x & GDDR6 both are rated upto 16Gbps (QDR) & in the end the memory bus (width) determines the winner. HBM is rated up to 2TBps IIRC, with HBM3. Good luck connecting GDDR6 chips with a 4096 bit wide bus. I feel like HBM is the rambus of gfx card memory. Stats look great, but so little adoption. 100% wrong. Bandwidth comes down to 3 things: Data Rate, Clock Speed, and Bus Width. GDDR6 and GDDR5X both have the same data rate. So if clock speed and bus width are also both the the same, meaning all other things are are the same, GDDR6 and GDDR5X will produce the same exact bandwidth. Period.